Set next to a sprawling 300 metre sandy beach the Conrad Bali offers an idyllic location between Nusa Dua and Tanjung Benoa. 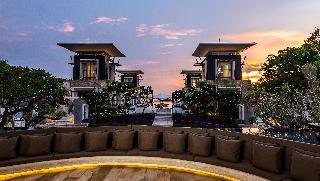 Guests will find themselves within easy walking distance of a variety of shops and restaurants and the complex is situated a 30 minute drive from Ngurah Rai airport. The hotel boasts quintessential Balinese style amidst a 2.5 hectare tropical garden comprising a lagoon and waterfalls making it a tranquil oasis exuding relaxation and harmony. The complex's vast array of facilities and amenities include a bar, 3 a la carte restaurants serving a host of delectable delights and a conference room to cater to the needs of business guests. There are also a host of activities available to ensure that the needs of every type of guest are tended to. The resort is within walking distance of the famous Kuta and Legian beaches, lifestyle shops as well as international bars and restaurants. 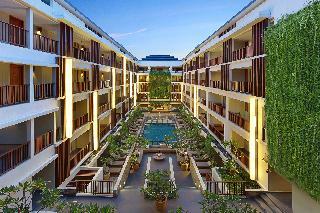 The resort is only 25 minutes' drive from Bali's International Airport. This boutique club resort features a lobby, a hotel safe and lift access. Guests can enjoy a drink at the cafe and bar, and dine in the restaurant. Moreover, guests can enjoy the convenience of a business centre, conference facilities and currency exchange facilities. Each air-conditioned room is designed with a contemporary feel and aesthetic sensibility. All of them are equipped with a private bathroom, double or king-size bed and a spacious balcony or patio. Moreover there is satellite/cable TV, a CD and DVD player, as well as tea and coffee making facilities. Located in the highlands of Bali, this resort overlooks the sacred Ayung River valley. A teak bridge over the dramatic gorge leads to the resort's entrance and there an elliptical lotus pond, seemingly floating above the trees, sits on the roof of the resort's three-storey main building. Once its guests take the stairway which leads down to the lobby they will be stunned by the 180-degree views over the valley which it offers. The resort's enormous suites in the main building and villas offer the ultimate in comfort and convenience. Each of the villas is free-standing, with a spacious garden and a private plunge pool, where guest can relax throughout the day. There is also a large pool for those who want to start their day with a refreshing swim. The Puri Lukisan Museum is 15 minutes' drive away and is the nearest place where one can see the traditional Kecak dance. 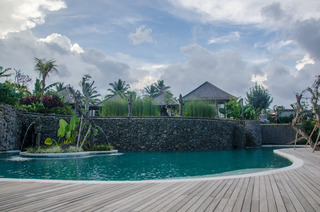 The Bali Mandira Beach Resort & Spa boasts an idyllic setting close to several kilometres of white sandy beaches near the tourist centre of Legian. A variety of entertainment venues, restaurants, shops and bars are within easy walking distance of this beach resort. 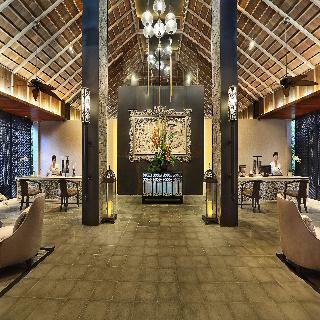 It is a mere 6kms from Ngurah Rai airport.Often referred to as the epitome of classic Balinese style, this complex offers a range of entertainment options to ensure that each stay is memorable. Two stylish restaurants serve guests an array of culinary delights with a mixture of Asian and international cuisines. 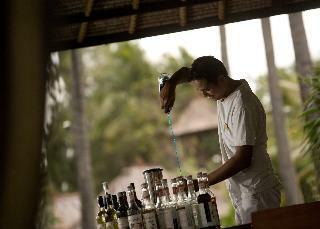 There is also a cosy lounge bar where guests are invited to sit back and unwind, enjoying renowned Balinese hospitality. Nusa Dua Beach Hotel & Spa is located on Bali's southern peninsula, just 15 minutes from Ngurah Rai International Airport via the Bali Mandara toll road. The hotel has welcomed kings and queens, presidents and other dignitaries over the years. Each guestroom is decorated with authentic Balinese furnishing and offers stunning views of manicured tropical gardens or vistas of the ocean from the terrace or balcony. 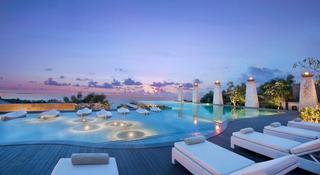 The 5-star Nusa Dua Beach Hotel & Spa, Bali features 3 outdoor pools and direct beach access. The resort resembles a Balinese palace with complete Spa facilities, 4 Restaurants and 4 Bars, meeting rooms and an outdoor theatre. Wi-Fi is available throughout the hotel. Located on the verdant hillsides of Ubud, Ubud Village Resort & Spa is a perfect Balinese hideaway for romantic couples, honeymooners and families alike. Overlooking an expanse of gorgeous terraced rice paddies, Ubud Village Resort and Spa has a relaxing atmosphere throughout which is further enhanced by excellent service and guest amenities. Ubud Village Resort & Spa is a retreat style boutique resort designed for relaxation, invigoration and peaceful contemplation. Various activities showcase Bali's artistic heritage with interactive classes of dance, music, painting, cooking, and fruit sculpting and wood carving. While our adventure programme of trekking, cycling and rafting caters to those with more active tastes.